Charter your flight to one of the most beautiful old towns of Jamaica. Port Antonio was known as a sleepy coastal town until the 1880's when Lorenzo Dow Baker started the first banana trade in Jamaica that is when the town was put on the map! Tourists from all around the world come to Port Antonio to ride in the boats and tour the banana trade routes. "Portie" literally became "boom town" overnight because of the banana trade. Many movies were and still are shot in this port of Jamaica you may have seen a few in the past such as "Club Paradise" and Tom Cruise in "Cocktail". 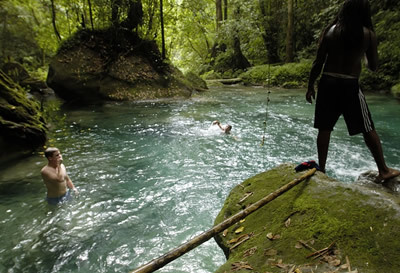 The 1990 thriller film Lord of the Flies was filmed on location in Port Antonio, particularly Frenchman's Cove. If you really know your movie star trivia then you know that Errol Flynn Zaca washed ashore in Jamaica after a tropical storm. He bought nearby Navy Island, part of the British historic Fort George in Port Antonio as well as hundreds of acres of farmland along the Portland coastline. One very popular location for you to enjoy after flying in on your private Caribbean Air Charter is the Blue Lagoon. Which owes its stunning color to its deep water of nearly 200 feet deep. If you like to venture the town you will want to visit the ruins of Folly Mansion and the historic DeMontevin Lodge. Why not brush up the tan at Frenchman's Cove Beach! Stop by and say hi to all the wonderful people at the Rio Grande, Boston Bay and Reach Falls as they are all within close distance. 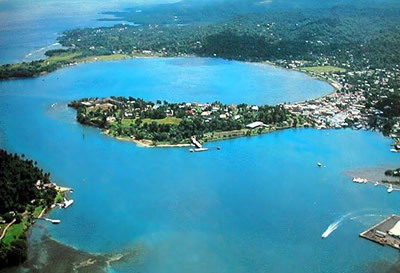 Many members of royal families, movie stars, great musicians, and well-known politicians have visited Port Antonio. What are you waiting for? Book your Private Charter and will will fly you into Jack Jones airport today!